0	0	John Sentamu's Faith Stories	In Stock - Order before 4pm for same day dispatchWant it on Wednesday 24 April? 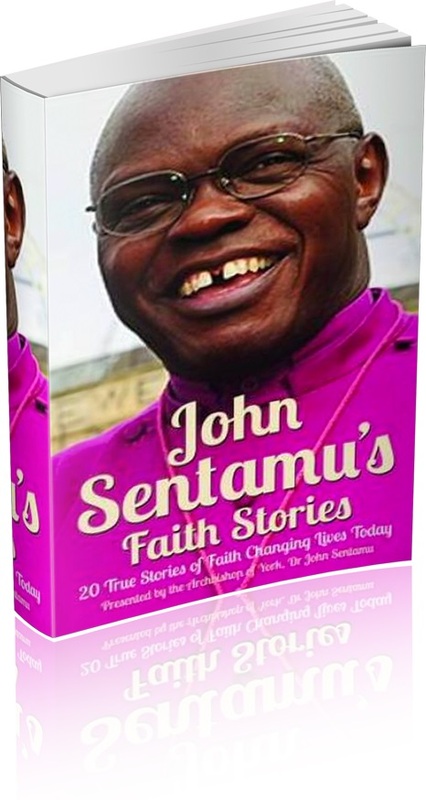 Share in this collection of 20 real life stories presented by Archbishop of York, John Sentamu. Rich and varied these first hand experiences of God will comfort and strengthen. 'Faith Stories' are the real life experiences of faith which show how radically surprising and life changing the Christian message can be. These stories are the living proof of how powerful faith can be, and an encouragement to all who struggle to live by faith. Ordinary people doing ordinary work tell how their lives continue to be transformed through their personal encounter with the Holy Spirit, and how their lives changed the lives of others. The faith stories of the Church are never the same, yet all are rooted in the communities where members live, work and worship. People come to faith at all stages of life from childhood to old age; it maybe through a sudden, life-changing experience or a gradual realisation of a personal Christian faith. Every day, Christians are living out their faith; open and listening to God as they accept new challenges and new ways of life. Using whatever abilities and opportunities God has given them. These are the people taking the Gospel out onto the streets, exploring their faith and continuing to grow and connect others with God. John Sentamu’s ‘Faith Stories’ shows you ordinary men and women doing extraordinary things, encouraging individuals to live out the Gospel and really making a difference in their own lives and in the lives of others. John Sentamu's Faith Stories by John Sentamu was published by Darton Longman & Todd in February 2013 and is our 4744th best seller. The ISBN for John Sentamu's Faith Stories is 9780232529784. This is a cheerful and engaging book of short testimonies and stories of people who are for the most part engaged in what is often called Fresh Expressions – new ways of doing church, of being cchurch, active and committed to all it means to serve others. So we meet the vicar that is also a part-time hairdresser, the youngest female vicar to be ordained, the shy lesbian that came out, the war veteran turned vicar and a host of other people from different walks of life and different ages – people really living out their faith. The stories are all short, not much more than 5 or 6 pages each, and that includes the pictures and Archbishop Sentamu's short introductions. In each case he highlights the spiritual aspect of what they are doing and the relevance of that for the reader – a sort of short contemplation of how and why these things are important. Given the format of the book I think these would probably be excellent as assembly or RE material. Got a question? No problem! Just click here to ask us about John Sentamu's Faith Stories. The most authentic stories of Christian faith in the 21st Century come from the experiences of 'ordinary' people living 'ordinary' lives. In this unique book by compiled by John Sentamu, the Archbishop of York, 20 people with everyday lives, families and jobs explain what their faith means to them and how it makes an extra-ordinary difference. Some of these people face up to difficult personal circumstances on a daily basis - such as the widowed mother of two young boys, or the former soldier whose fellow soldiers were killed - others work for social justice in their local communities or use their unique gifts to communicate the good news of the gospel. All stories are inspiring demonstrations of Christian faith in everyday action. Sentamu has written a personal introduction to each story and to the book as a whole. Each story includes a photo of the subject. If any phrase should naturally follow the name John Sentamu, it’s in the words ‘speaks out’. The Archbishop of York is not a man to keep quiet: social care, the 2011 riots, marriage, international aid, bankers’ bonuses, equality, Lords reform and even the public interest in the Post Office, are just a few of the issues of the day where John Sentamu has left the nation in doubt of where he stands. Starting out as an advocate and member of the judiciary during Idi Amin’s despotic rule of his Ugandan homeland, the Most Revd and Rt Hon Dr John Sentamu also knows the real cost of speaking out. In Uganda, and in his career as an Anglican churchman, John has witnessed the faith and courage of individuals prepared to risk all for Christian principles and for the greater good. 'The Greater Good' always means the greater good of someone else. And that might well be someone whose wellbeing is not in way helpful to your own advancement. Often, actively improving the lot of others is detrimental to the wellbeing of the activist. Good works has never been a guarantee of good fortune. History is littered with the corpses of those who stood up for the lives and liberties of others. Yet without the people who are prepared to make the sacrifice, nothing would change. And without their faith stories there’d be no evidence that change can happen and no encouragement to make it happen. Recording and retelling stories of faith is of profound importance to changing lives for the better at every level of human society. It’s worth noticing that faith stories are inevitably about individuals – what they witness, what they do, what they say and what they suffer. Yet what they achieve is almost always on much larger scale. The faith of just one individual changes the life of anything from a family or a community, sways a nation or has an influence on a global scale. One of the most famous and shocking faith stories of the last century is that of Oscar Romero; Archbishop of San Salvador, murdered on the steps of his cathedral in 1980. Speaking to commemorate this sacrifice of a man of faith who spoke out for those denied a voice, John Sentamu compared Romero’s refusal to stay silent to Jesus’ reading of Isaiah 61 in the synagogue at Nazareth. The sixth child in a family of thirteen, John Tucker Mugabi Sentamu was born 10 June 1949 a member of Uganda's Buffalo clan. Educated by English missionaries and teachers, he graduated from Makerere University, Kampala with a law degree going on to serve as an advocate and in the judiciary in Uganda’s High Court. John Sentamu criticised Idi Amin’s regime for its violation of human rights. His sentencing of Amin's soldiers led to his arrest and departure from Uganda to the UK in 1974. In the UK, John Sentamu read for a masters degree and a doctorate in theology at Selwyn College Cambridge. Following his ordination from Ridley Hall, Cambridge he served as the college’s assistant chaplain and then as chaplain at HM Remand Centre Latchmere House before moving on in 1982 to become curate of St Andrew's, Ham in the Diocese of Southwark. From his curacy of St Paul's Church, Herne Hill, South London John went on to his first position of priest-in-charge at Holy Trinity, Tulse Hill and then parish priest at St Matthias Upper Tulse Hill, later combining with Holy Trinity as a joint benefice. He left his final priest-in-charge role at St Saviour Brixton Hill on his appointment as Bishop for Stepney in 1996. Appointed Bishop for Birmingham in 2002 and Archbishop of York in 2005, John Sentamu’s is officially the Primate of England and Metropolitan, a member of the House of Lords and a Privy Councillor. The first black Archbishop of York, John Sentamu’s legal and court experience made him ideally fitted to serve and advise on a number of high profile public enquiries including the Stephen Lawrence Judicial Inquiry, and the Damilola Taylor Murder Review, which he chaired in 2002. With a concern for social justice at all levels, he has been the chairman of the NHS Haemoglobinopathy Screening Programme since 2001, supported and advised workers affected by the closure of the Rover car plant in Birmingham and campaigned against the violence and drugs of Midlands gang culture after the killings of Charlene Ellis and Letisha Shakespeare. The pressures on, and opportunities for, young people are also a concern of his. Between 2002 and 2004 he was Chairman of the EC1 New Deal, President of Youth for Christ in 2004 and President of the YMCA in 2005. Also a Fellow of the Royal Society of Arts, Dr Sentamu’s other interests range from cooking through music and reading, and on to athletics, rugby and football. He is married to Margaret, and they have two grown-up children, Grace and Geoffrey. They also have two grown-up foster children. Together with 'Faith Stories', other books by 'The Most Revd and Rt Hon Dr John Sentamu' - to use his full title, include: ‘The Money Revolution: Applying Christian Principles to Handling Your Money’ and ‘Roots And Wings: a report of the Black Anglican Celebration for the Decade of Evangelism . 'Faith Stories' is Archbishop of York, John Sentamu 's collection of 20 real life stories showing how radically surprising and life changing the Christian message can be. These stories are a revelation and encouragement to all who struggle to live by faith. ‘Faith Stories’ shows you ordinary men and women doing extraordinary things, exploring their faith and continuing to grow and connect others with God. Using whatever abilities and opportunites God gives you, you'll be encouraged to let faith make a difference in your own lifes and in the lives of yourr family, community, church and nation.